Stephen Triffitt brings the Frank Sinatra sound to Benidorm this Christmas. Join in the fun and have a night to remember !! Terra Mitica, once again offer you a special Halloween Night Celebration on the 31st of October 2015. Benidorm’s Mayor Toni Perez, took part in this year’s local Poppy Appeal along with the British Consul in Alicante, Sara Jane Morris and representatives of the Royal British Legion and the Poppy Appeal in Spain, Lloyd Millen and Nigel Hails. The Oktoberfest is the largest beer festival in the world. Held in Munich, Bavaria, it was first held in 1810 to celebrate the wedding of Crown Prince Ludwig to Princess Therese. All Munich citizens were invited to attend the celebratory events in the fields in front of the city gates. The festival is now the largest beer festival in the world. Benidorm will hold its own Oktober from the 22nd – 25th of October in the Calle Santo Domingo, which is known as the Tapas Street, with live music daily. 22:00 – Inauguration in the Plaza de la constitution by the Mayor and the Presidente of the Oktoberfest in Calpe. Motorcity Concert 21:30 in the Calle Santo Domingo. DJ Oktoberfest 23:00 in the Calle Santo Domingo. German Day Celebrations all day in the Calle Santo Domingo. If you come dressed in Bavaria costume you get a free beer. Paella 13:30 in the Plaza de la Consitucion prepared by Master rice chef Miguel Angel Alvarez Ortiz . Portion of Paella 3€. The Boat trip from Benidorm to Tabarca Island ceases for the winter 2014 season as from today 31st October 2014. The trip will commence again for summer 2015 at Easter. Terra Mitica and Mundomar Benidorm – Closing Dates for Winter 2014 & Opening Dates for 2015. Terra Mitica and Mundomar theme parks in Benidorm will close for the Winter season on the 2nd of November 2014. Vets at the animal nature park Terra Natura in Benidorm took a dhole for a CT scan at the local Marina Baixa Veterinary Hospital in L’ Alfas del Pi. The psychic event of the year in Benidorm. An truly spiritual evening brought to you by Costa Promotions. The Tremeloes & Wayne Fontana Live in Benidorm 30th November 2014. Another great offer from Terra Mitica Benidorm for Halloween 2014. Benidorm Palace – The Drifters 25th , 26th & 27th December 2013 Tickets here. Christmas 2013 in Benidorm Palace. The Drifters will be performing live this Christmas at the Benidorm Palace. Christmas Day and Boxing Day celebrations include two very special Gala Dinners as well as The Drifters and the Benidorm Palace show “Nostalgia”. The Drifters Boxing Day 2013 Benidorm Palace - Reservations on line. Boxing Day Celebrations in Benidorm Palace with the Drifters. Mundomar has released a new 2 x 1 offer to coincide with Halloween. A great offer from Terra Natura Benidorm for Halloween. Celebrate Halloween 2013 in Mundomar Benidorm with a special themed evening complete with dinner and the Phantom of the Opera Show . Celebrate Halloween in Terra Mitica Benidorm from the 5th of October until the 3rd of November. Join "Harry" in Terra Natura Benidorm for the Spells and Magic School on Friday 1st of November 2013. 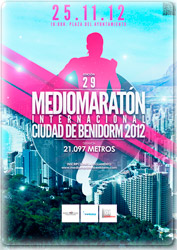 Benidorm'sHalf Marathon will take place this year on the 25th of November 2012. 10km race in Benidorm 25th November 2012. 1st 10km International City Race in Benidorm 25th of November 2012. The Valencian Napoleonic Association, studies and teaches historical events and culture from the XIII to the XVIII Centuries, as well as the Napoleonic era in the Valencian Community. As part of the Benidorm Cultural Week they will recreate the Historic War of Independence Benidorm 1812. The event has been organised by the Benidorm Town Hall and the Committe from the Benidorm Fiestas and will take place on Saturday 3rd of November 2012. 10:30 Plaza de San Jaime (San Jaime Square) – Floral offering by the troops to the Virgen del Sufragio (Our Lady of Suffrage). Locals will perform the "Dance of Peuet" (Baile del Peuet), in the Alameda (Alameda del Alcalde Don Pedro Zaragoza also known as the Avenue of Alcalde Don Pedro Zaragoza). A traditional dance over 150 years old. 18:00 h. SWITCHING ON OF THE LIGHTS. The official lighting of the lights adorning the Martínez Alejos street by the Queen of this years Festivities, Miss. Andrea Ripoll Llorca and our Junior Queen, Andrea Nieto Carrillo, along with their Maids of Honor, and accompanied by musicians from the Union Musical of Benidorm. 18:30 h. Both Queens and their Maids of Honour will officially open the fairground loacted next to the Bullring. NOTE: Traditional childrens day at the fair with reasonable prices. 20:00 h. Judges pay a visit to the streets and neighborhoods participating in the STREET DECORATING CONTEST, Trophy “PEPA ESPERANZA LLINARES LLORCA ” (Inscriptions at the Casa del Fester until November 06). 1st prize: 500€ + Trophy, 2nd prize: 300€ + Trophy and 3rd prize: 200€ + Trophy. 22:30 h. THE PEÑAS. All the Peñas will meet in the Calle Ruzafa and then parade down the Ruzafa and Martínez Alejos streets. At the end of the route, commemorative plaques will be given to the peñas on behalf of Benidorm Town Hall and the Association of Peñas "Virgin of Sufferage" will l pin the ribbons on all the flags and banners. 09:00-19:00 h. Bowling (PETANQUE) contest organized by Benidorm's petanque club at the Mercasa tracks. 10:00 h. HOLY MASS at the Parish Church of Saint James and Saint Ann or San Jaime and Santa Ana Parish Church in honor of our patron saint the VIRGEN DEL SUFRAGIO (OUR LADY OF SUFFERAGE), presided by the rev. D. Luis López Hernández, parish priest of San Jaime and Santa Ana and sung by “ A.R.C. La Barqueta”, attended by the Committee, Queens, Court of Honor, Standard-bearers, Mayorales de Honor, Authorities, Peñas and all the neighbors who would like to accompany us. 11:45 h. OPENING OF THE DOORS of the SAN JAIME y SANTA ANA CHURCH (SAINT JAMES AND SAINT ANN CHURCH), where Our Lady of Suffrage is kept, and in her presence the Benidorm Fiestas begin. 12:00 h. BELL RINGING AND FIREWORKS announce the beginning of the 2012 Festivities in honour of our Patron Saint. Fireworks Display provided by the prestigious Fireworks company Pirofantasía Carlos Caballer in the Plaza Castelar (Castle Square). 12:15 h. From the Plaza de San Jaime (Saint James Square) and accompanied by the Queens and the Maids of Honour, Standard-bearer, Mayorales de Honor and the 2012 Fiestas Committee, there will be a parade of bands through the streets. 1.Agrupación Musical Acústica de Elda (who will accompany both queens to the Town Hall to collect the pennant. 13:00 h. CONGREGATION OF BANDS at the Plaza SS.MM. Los Reyes de España, where they will all play the pasodoble “FIESTA EN BENIDORM ”, directed by the composer Mr. D. RAFAEL DOMENECH PARDO. The Queen will award a ribbon to every band. Afterwards, we will open the Marquee of the 2012 Fiestas Committee. 16:30 h. The XLIII Sports Trophy organized by Club de Colombicultura "La Isla", en Barranco de Xixo. 17:00 h. RE ENACTMENT OF THE DISCOVERY OF OUR PATRON SAINT LA VIRGEN DEL SUFRAGIO (OUR LADY OF SUFFERAGE) on the Playa Poniente Beach, by actors from A.R.C. “La Barqueta”, following the script by D. Pere Maria Orts i Bosch which takes us back to March 16th, 1740 when a drifting boat was spotted of the coast. 17:30 h. The Benidorm Musical Union our prestigious local band. 18:00 h. PROCESSION with all the local dignatories, the Queen and Infant Queen, Maids of Honor, Standard-bearer, Mayorales of Honor, Mayorales and Mayoralesas (festivities committee), Peñas, Cultural and Religious Entities and Benidorm residents. The procession will take the following route: Parque de Elche, Paseo de la Carretera, Alameda del Alcalde D. Pedro Zaragoza Orts, Calle Mayor & will finish at the San James' Square ( Plaza San Jaime). When the procession arrives at the parish church of San Jaime & Santa Ana, there will be a FLORAL OFFERING TO OUR LADY OF SUFFRAGE. Once the floral offering is complete the Infant Queen, Andrea Nieto Carrillo, will recite a poem written by Vicenta Pérez Bayonne, “ Cuqui “, to our Patron Saint and later, the Queen Andrea Ripoll Llorca, will address the village of Benidorm. OPENING SPEECH - BENIDORM 2012 FIESTAS from D. MATÍAS PÉREZ SUCH. The president of the Fiestas Committee, D. José B. Ferrer Caballer will say a few words as will the Mayor of Benidorm, Don Agustín Navarro Alvado. Firework Display - from Pirofantasía Carlos Caballer in the Plaza Castelar. 00:30 CONCERT at the Julio Iglesias auditorium; MELENDI, singer and writer of Spanish-rumba mixed with pop and rock, and currently a coach in the t.v. program La Voz. Terra Natura Benidorm - Monkeys catch colds too!! The primates in the Benidorm Theme Park Terra Natura are preparing for the winter season just like humans and are dosing up on vitamin C to help prevent colds and the flu that are common at this time of year. Staff at Terra Natura are giving Vitamin C supplements to the primates and will continue to do so until the end of March next year, when the risk of flu and the common cold is less virulent. 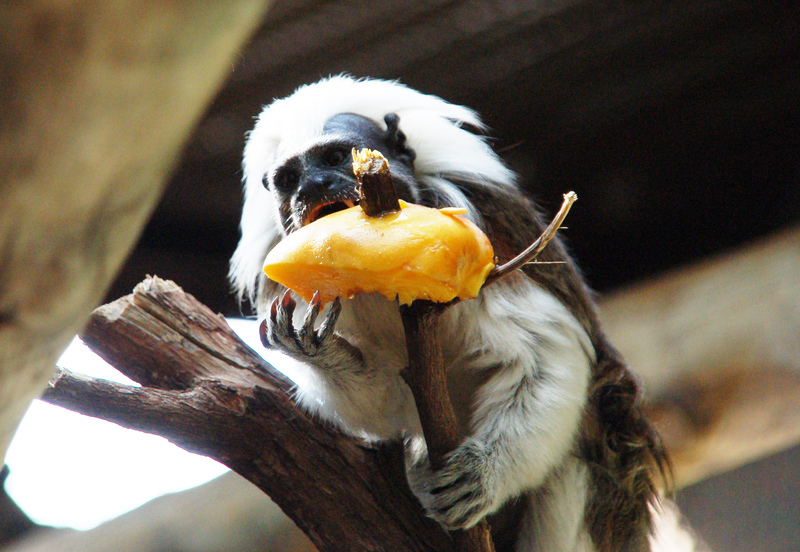 Primates are susceptible to the same germs that cause colds and flu in humans. The symptoms are even the same, runny nose, sneezing, cough, sore throat and even fever. White- handed gibbons (Hylobates Iar) , siamangs (Hylobates syndactylus), capuchin monkeys (Cebus apella), squirrel monkeys (Saimiri boliviensis) and six other species of titi living in the park, will be given vitamin C Supplements administered in drops, added to their porridge . Special treats will also be given containing vitamins to help boost their immune system, so the monkeys should be strong enough to fight off any viruses. If any of them do catch a cold, treatment is the same as with humans, medication to reduce the fever, cough and mucus, along with plenty of fluids. If there is no improvement, anitbotics may be administered. To ensure the well being of the mammals if any of the staff have a cold they will use gloves and masks to prevent infection. 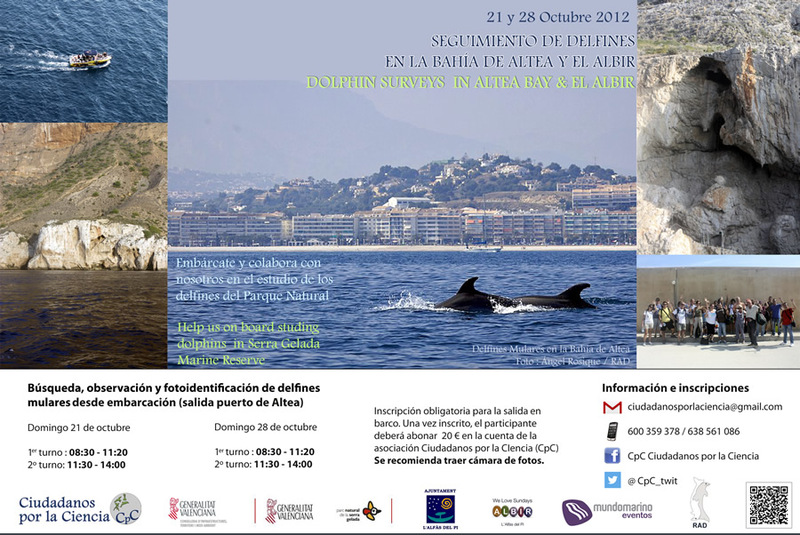 Two expeditions have been organized for Sunday 21st of October and Sunday 28th of October by Citizens for Science to comprise a survey of the bottle nosed dolphins along our coastline. 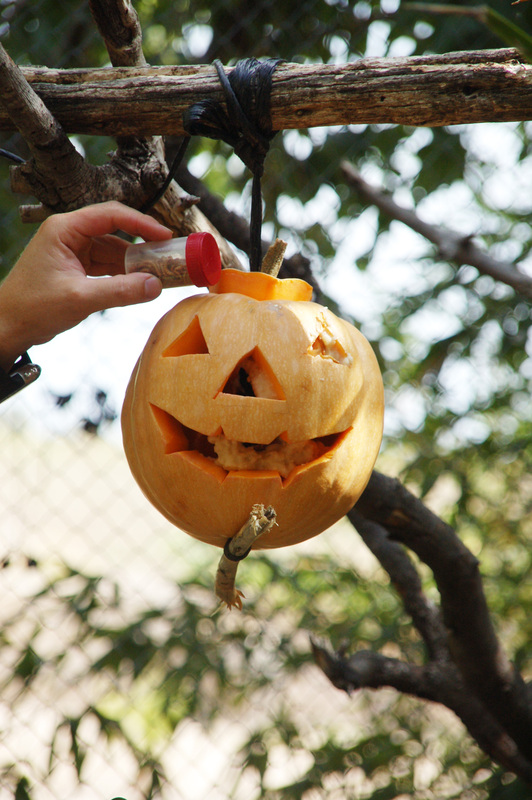 Terra Natura in Benidorm will celebrate Halloween this year with a Special Offer. One FREE child with every paying adult. This Halloween offer is valid from the 6th of October until the 25th of November 2012. “Gravediggers” will surprise guests as they stroll around the park and there will also be a Halloween based Chinese Shadow Theatre for the younger visitors. There will be GORY workshops where with the help of make –up you can create monstrous wounds. The Sea Lion Show and the Bird of Prey Show will also be themed plus there will be a equestrian demonstration from Diabolo. In the Pangaea area, the “Volcano” has been converted into the “Volcano of Terror” . There will be guided tours to explain the myths and legends surrounding some of the animals in the park. Animals that are generally associated with Halloween, for example, owls, bats and snakes. Also new is the chance to feed the elephants, buffalo or rhino with pumpkins. 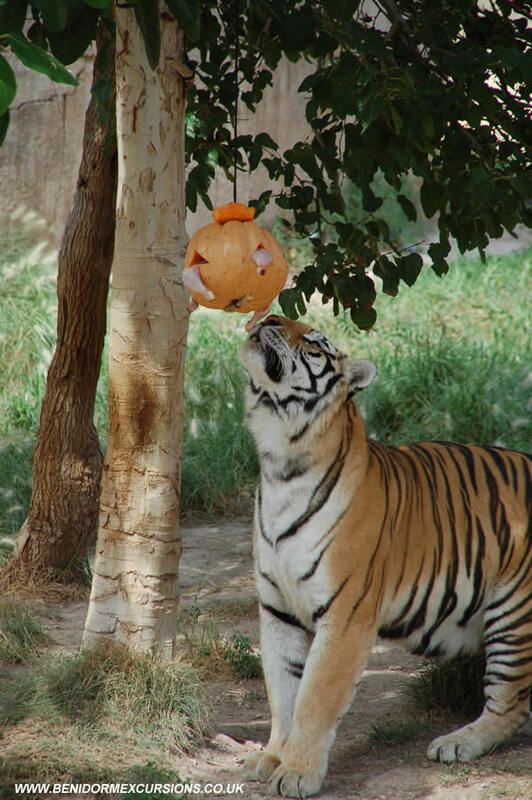 Tigers will have their pumpkins filled with meat to entertain them and will along with the other animals enjoy this amazing vegetable in their diet during this period. Take advantage of this special offer and purchase your tickets on line here. Kick Boxing World Championshiporganized by the Club de la Lucha K1. The event will be held on Sunday 16th of October 2011 at 18:30 in the Benidorm Palace. Club de la Lucha, Calle La Mar 193 Altea, Alicante. Benidorm Palace Box Office which opens from Monday to Saturday 10:00 - 20:00 horas. VIP Zone 100€ with Menu Plus. Stalls 35€ with first drink included when tickets are purchased in advance. Telephone Benidorm Palace Box Office +00 34 96 585 1660. 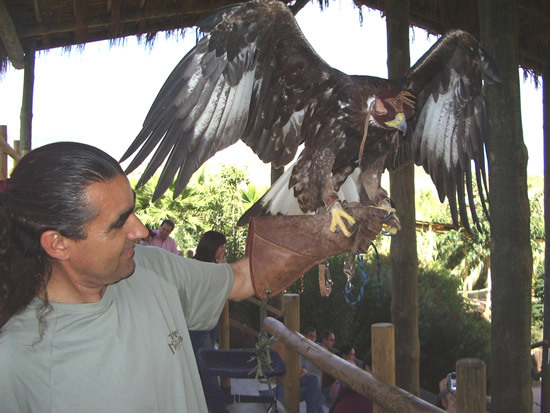 This autumn's workshops in Terra Natura Benidorm will focus on birds and poisonous animals. The Benidorm theme park has launched a new program of activities which will take place in October and November. The workshops will start next weekend and aim to increase the visiting public’s awareness of the need to protect all creatures and how we can conserve the fauna and flora on our planet. 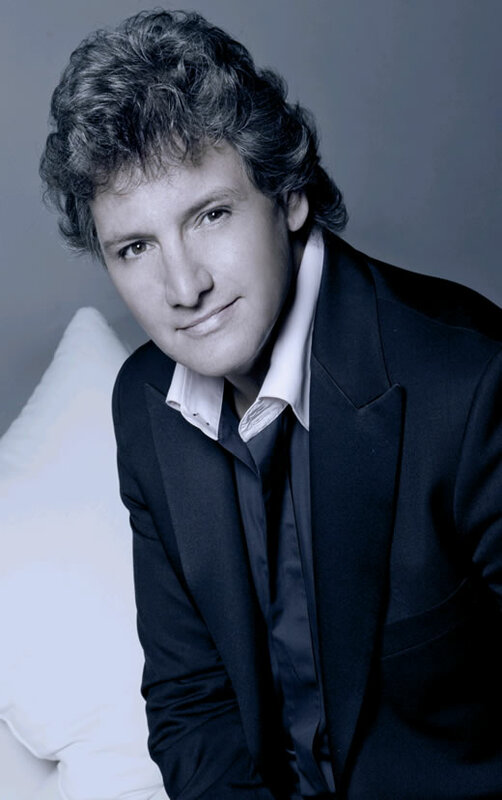 Benidorm Palace presents Rene Frogerlive in concert. The Dutch singer will perform on Wednesday 17th of November 2010 at 20:00 hours. Dinner with the Benidorm Palace show "De Luxe"and the Rene Froger concert 50€. Show , concert and first drink 28€. Consult www.benidormpalace.es to view the menus or telephone +00 34 96 585 1660. Mustafa Danger the main attraction at the Benidorm Circusflirts with danger on a daily basis. He performs live every Sunday at the Benidorm Circus and has just been awarded another Guinness World Record. On this occasion he drove a motorbike across a thin steel cable which was attached to two points, 140 metres from the ground and approx. 500 metres apart. Mustafa was assisted by a fellow countryman who acted as a counterweight hanging from the undercarriage of the bike. In achieving this, Mustafa broke his previous record for height and distance which he established by crossing the Real Madrid football pitch, the Santiago Bernabeufrom one extreme to the other. i.e. from the north side to the south side, a distance of 200 metres, 40 metres from the ground. This dangerous feat captured the attention of the spectators who were spellbound during the interminable minutes it took to complete. Mustafa Danger became a tightrope artist 20 years ago at the tender age of 14. The circus artist can list among his achievements crossing the 350 metres between two mountains in New York and to have crossed the Berlin Town Hall Square in a attempt made more dangerous by the strong winds at the time. This extraordinary Moroccan artist, who performs every Sunday in the Benidorm Circus Show Chapito, demonstrates that he is the authentic King of this speciality. 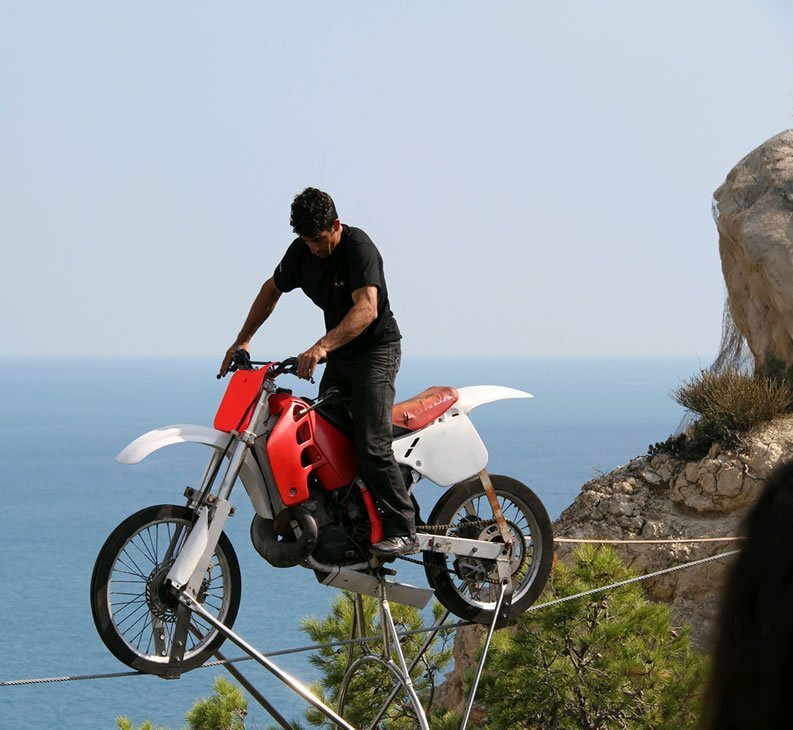 His next challenge is to obtain a Guinness World Record on Thursday 14th of October when he will at 12:00 attempt to cross the distance between the Gran Hotel Bali and the Tossal de la Cala, on a motorbike, across a steel cable approximately 180 metres in the air. The date and time of this attempt is subject to weather conditions. In 1979 the General Tourist Organisation created World Tourism Day, which is celebrated yearly on the 27th of September. The aim was to promote tourism in all forms and maintain the values associated with it. September was the chosen date for the celebrations as it coincided with the end of the season in the Northern Hemisphere and the start of the season in the Southern Hemisphere. 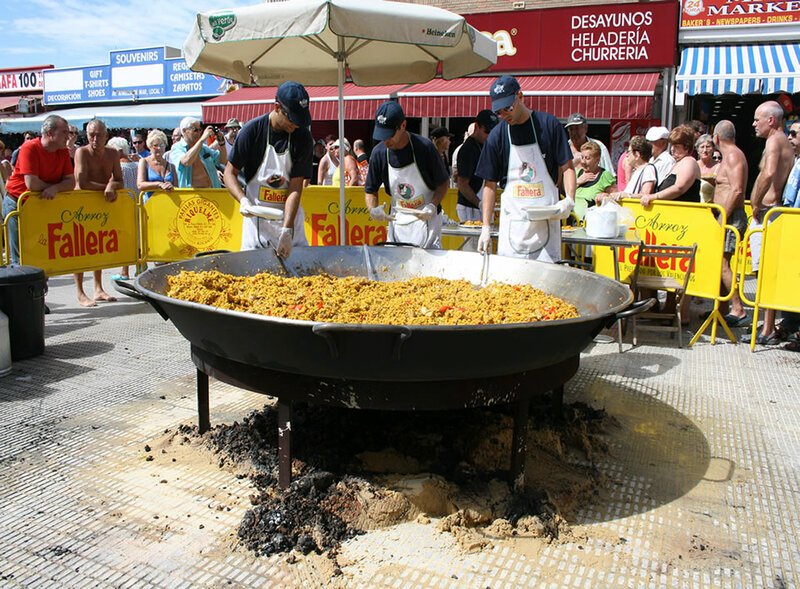 Benidorm joined in the festivities this year and served four gigantic paellas in strategic areas of the city, each paella seving 1 thousand portions. In the afternoon a procession wound its way through the main streets ending in the Plaza SS.MM Los Reyes. Various attractions from the city were represented and it was attended by thousands of tourists. 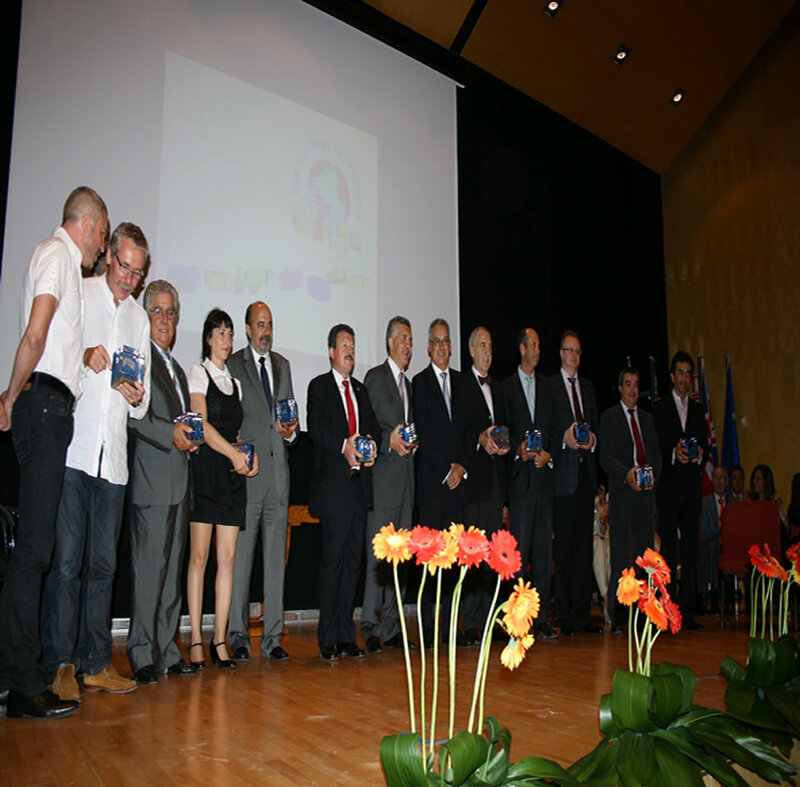 Benidorm also held an award ceremony on the24th of September honouring those who had contributed to the promotion of tourism in this area which is of great importance to the local economy. Ignacion Vasallo Director of the Spanish Tourist Office in London; Tour Operator Natalie Tours; the ITV Television Series "Benidorm"; The National Organisation for the Blind (ONCE); Imserso; Esther Eiros, Director of the Radio programme "Gente Viajera" for Onda Cero Radio; Pere Joan Devesa ex presidente of Hosbec and empresario of the Poseidon Hotel chain; Aqualandia - Mundomar; Benidorm Palace; Hotel Villa Venecia from the Magic Costa Blanca Hotel Chain and the Low Cost Festival. Sporting events in Benidorm are another attraction for visitors. The Davis Cup, celebrated last year is a good example as is the World Rhythmic Gymnastic Championshipscelebrated in the L'illa de Benidorm Sports Centre. The local Volleyball team which has reached top level nationally wanted to contribute so they created a tournament in which national and international teams could compete before the start of the official season. After 3 days the competition concluded with very positive results. The Benidorm Beach Volleyball Club under the direction of David Lopez Egea, fought for the final with the Italian Club Cariparma Sigrade classified as A2 Feminine. A weak start by the Italians who lost the first two sets 25 -13 and 25 -9 respectively, led the locals to believe that they could win, so they upped their attack and defence. The Italians played the better game and won with a marginal 29 -27. The University of Burgos and the French team Stella Es Callais played for third place which went to the Spanish superleague team 3 sets to 0. The first phase of the tournament was held on 23rd of September with four teams playing each other. The playoffs continued on Friday morning and the afternoon saw the games of those who had classified. The standard during the three day competition was high, allowing the trainers to assess the performance of their players and make any necessary changes before the start of the National Championhip season 2010/11. At the end of the tournament trophies were presented to the participants and awards given to the two best players. Mila Montani from the Italian Cariparma Sigrade was awarded Best Player and the young Elena Marmaneu from the Benidorm Beach Volleyball Club awarded Most Promising Player. The teams celebrated the close of the tournament in the Balcon del Rico where the players and entourage said their goodbyes until the next sporting event. The PITCH and PUTT golf course is located in the Sierra Cortina Urbanisation and has brought a new leisure activity to the area. 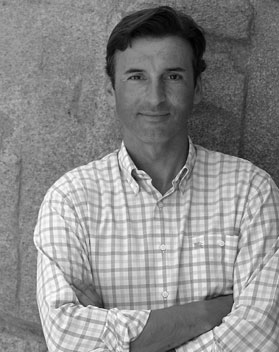 To find out more about this golf course we spoke to Javier Marroquin one of the managers in charge of the course who explained the characteristics and details of the course. Well this project actually requires less land than a traditional golf course. We are talking about 6 hectares in total instead of the 50 or 60 hectares that a conventional golf course requires. When we first visited the urbanisation and saw that there was some land available we put forward our idea which of course would add value to the residential complex. Work commenced in 2006 and to date we are still working on the project although we have permission to operate since 2008. What advantages does this course have? It has more advantages than the traditional golf course. The first is that it is a more economical sport to practice with the average price of 15€ per round. It also takes up less time. In approx 2 hours you can enjoy a game of golf instead of 4 hours for the conventional game. You also don’t need a perfect technique which means quicker learning period and greater enjoyment. What type of people use this course? We have a varied clientele. Generally residents with medium skills to those who wish to take up the sport for the first time. Saying that, we do not have a client profile and we strive to maintain these clients and to motivate others with tournaments, competitions and activities. What needs to be added to your installations to complete your offer? A Social Club and practise courts. The ones we have at the moment are provisional. We also hire all the golf equipment which is very popular with our visitors, especially our British clients that book their holidays with this service included. Have you been hit by the financial crisis? Golf is a popular sport; players are still attending especially those who are now not able to practise traditional golf so in that respect we have gained and not lost. Golfers want to practise their favourite sport and we are an alternative to the traditional round of golf. How important is this type of initiative to the area? I think that these projects are the way forward. They are generally large investments from the private sector and closely connected to the housing market. The high price of land along with the situation in the housing market means that these projects add extra value to the properties. The idea for these projects originates in Cataluña where there are 35 courses such as this one and nearly 40,000 players. In the Valencian Community there are only 7 such camps all of them 9 hole except ours which has 18. What about maintenance? What is needed to maintain the installations? Basically once the green is sown it is watered every evening in sections. Each area is connected to a weather centre that collects all the necessary data about the course and then waters each area according to its necessities. The water used in this process is residual.